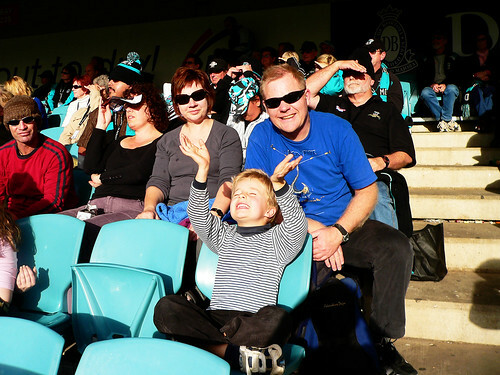 Yesterday afternoon 13 of us went to see an Australian Football League (AFL) game. Let me say that I’m not a fan of the footy as we call it but being at a game is different than sitting down and watching it on telly. It was also JJ’s birthday outing – he will be seven on Thursday. The leadup to the afternoon footy outing was horrendous. I was accused of his lordship being bored. As I reminded him more than once I was busy preparing for most of the 13 to come back to our place after the game for dinner. Because the attention was not focused on himself he was particularly awful to be around so by the time people started rocking up to our place I was ready to just stay home and leave them all to it. It’s sometimes very hard to act like the adult in this relationship! Things, however, got a lot better. We caught one of the footy express buses to the game and it was great. It took half an hour from door to door and because we had tickets for the game it was free. We didn’t have to worry about driving there or finding a park. We arrived an hour before kick-off so we had some time to kill but there is plenty going on around the place from activities for the kids to just people watching. 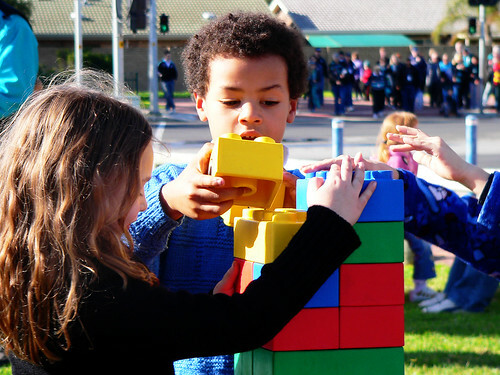 These big blocks were a winner. It was also a good opportunity to catch up with a couple of friends that came along while making sure the kids didn’t run off, but by the time they’d curbed their over-excitedness they were fairly bearable. Toward the end of the game JJ even sat by himself just watching the game. I also enjoyed taking the camera for an outing – it’s been a while, and I love the photo below. Not sure what he’s so excited about but it makes me smile just looking at it. JJ took this one! We were in the east stand and the sun shone in our eyes for the first half of the game and it was quite warm. I didn’t need my warm woollen coat at all. I ended up using it for a cushion. It’s easy to get distracted from watching the actual game. The guy with the beard behind us in this photo was very vocal and had lots to say about the umpires. There were some Richmond supporters nearby who got pretty drunk. One of them looked very seedy at the end of the game and ended up vomiting. JJ stood nearby mouth agape until he finally heard me calling to him to come along as we were going. I did, however, take some photos of the game and this guy was about to kick a goal. At the end of the game JJ informed me that he hadn’t had a good time and maybe it’s not his thing, but everyone else enjoyed themselves and we’ve decided to make it an annual event. I’ll just leave JJ home next time. There are more photos here. I took ‘Salina to a game at the Gabba when she was younger – it was great fun until half time then she had had enough – which was just as well, as the Lions won the first half!!!! Glad that, on the balance, a good time was had. 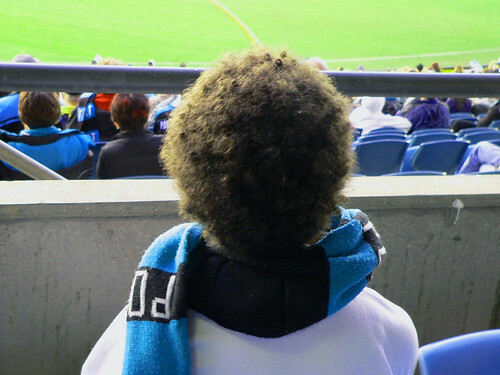 I think footy is really a game that can only be appreciated by kids via the idiot box – there’s too much going on around them, separate to the game, for them to be able to focus and enjoy it properly. Glad to hear you had a fun time, maybe take some activity books for JJ next time? Jayne, I think you hit the nail on the head there in regards to activities and being out of comfort zones. There was a girl behind us who was colouring in while her parents were yelling their heads off. Gorgeous photos – the grass looks soooo green. I thin it is a great idea to have annual events, creating small traditions is really important I think. PlanningQueen, I’ll let you in on a little secret. I did some post processing on the photos, but the grass was fairly green. I like small traditions and this could be a good one.